I mentioned before that I really like the Spotlight feature in OS X. 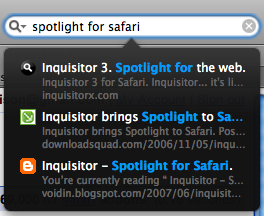 Well, a friend mentioned that I should check out Inquisitor, a Freeware Spotlight like add-on for Safari. It’s about as simple as it gets – rather than typing text into the Google search box in the upper right and seeing the Google results page, you can see a preview of a few pages right there at the top. One brief word of caution though; if you install it, make sure you are done with everything you have in your Safari tabs because without warning it shuts down Safari. I think you would like the BlitzSearch feature in HoudahSpot! Feel free to contact me for a NFR license.